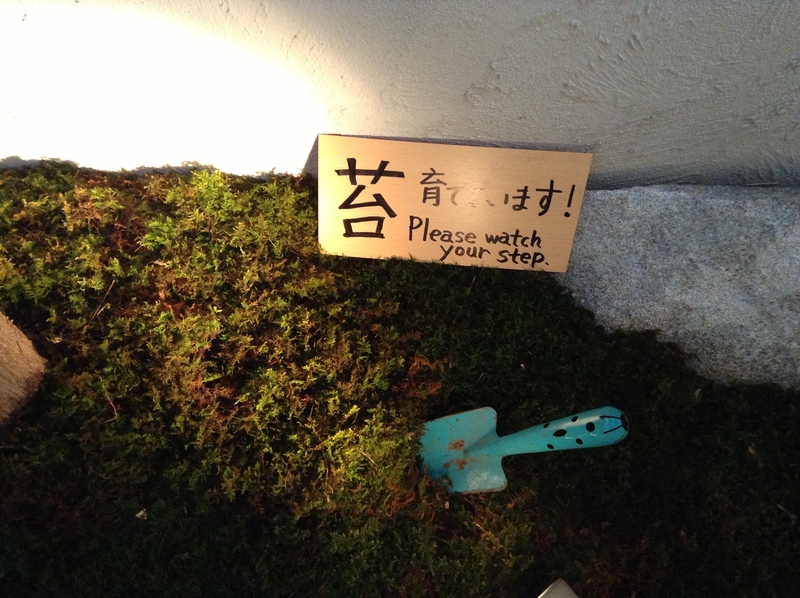 I thought the sign on the moss was curious. The blue shovel certainly caught my attention. Actually when I first walked up to Den, I thought it was a ceramics shop when I looked in the door. 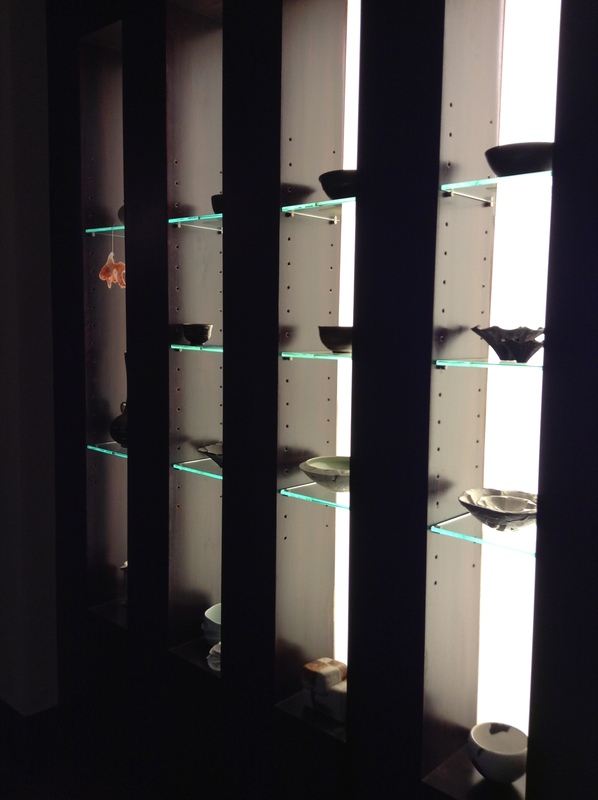 The backlit wall showcasing gorgeous pieces of pottery. So, I turned around and left, but then I realized this must be the shop. 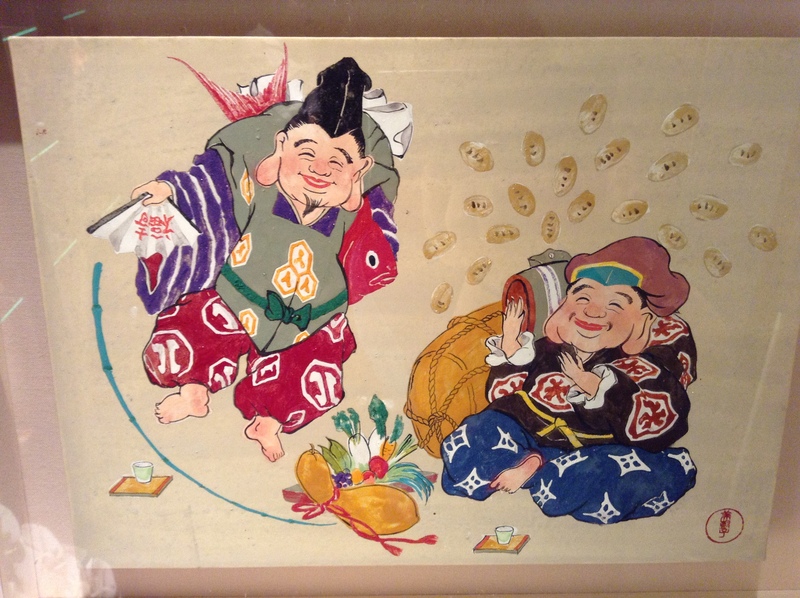 This colorful painting in the entrance was done by a friend of the chef. When I asked about these ceramics I was told that these too were done by potters from around Japan who are friends of the chef. I had recognized a few pieces and was hoping that they would be used during the meal. When I was seated I was brought a selection of colorful cloths, tenugui, to choose from to use as a lap napkin. 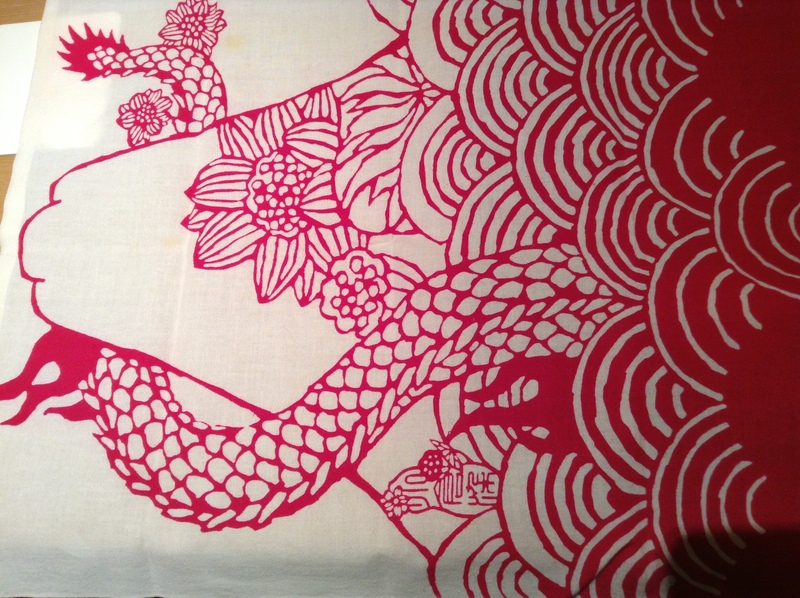 This bright pink and white one called out to me and the design of the dragon was so artistic. 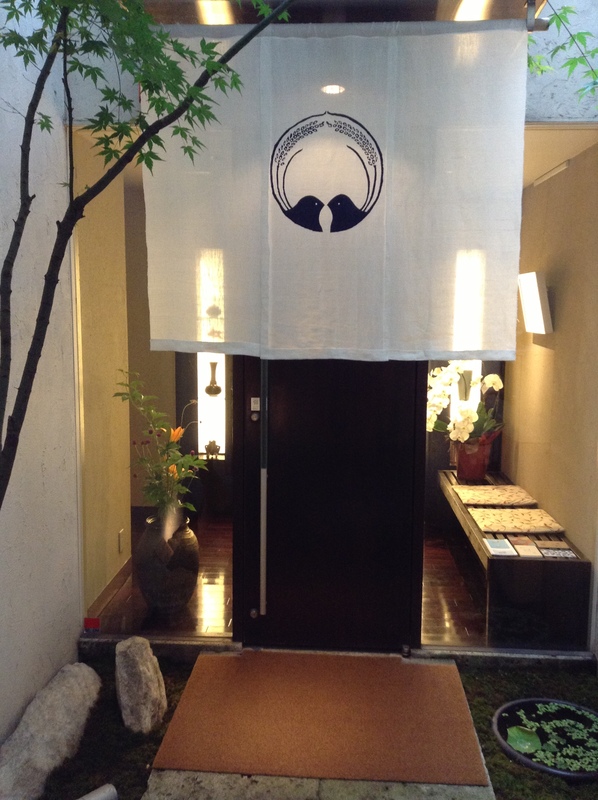 Chef said that his friend who designed the tenugui also makes summer kimono, yukata, out of material she also designs. 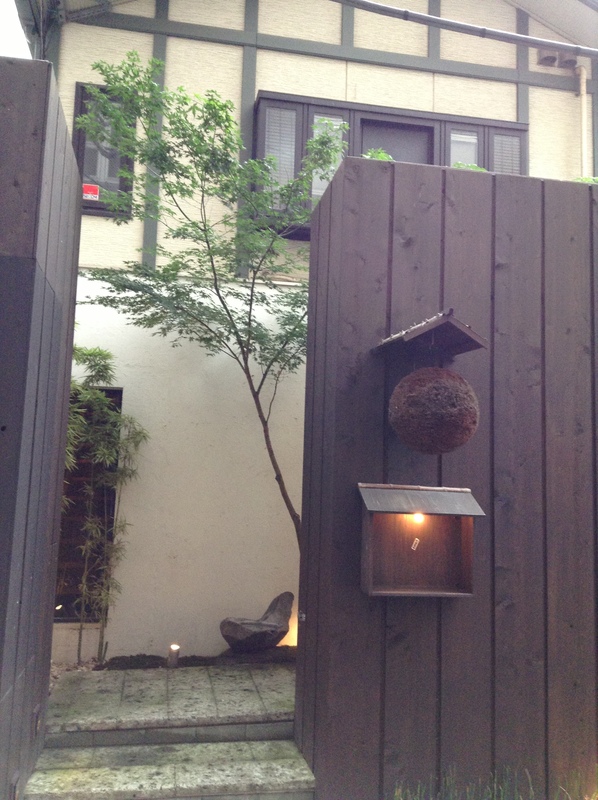 He said that her shop is in the Jimbocho area where Den is. 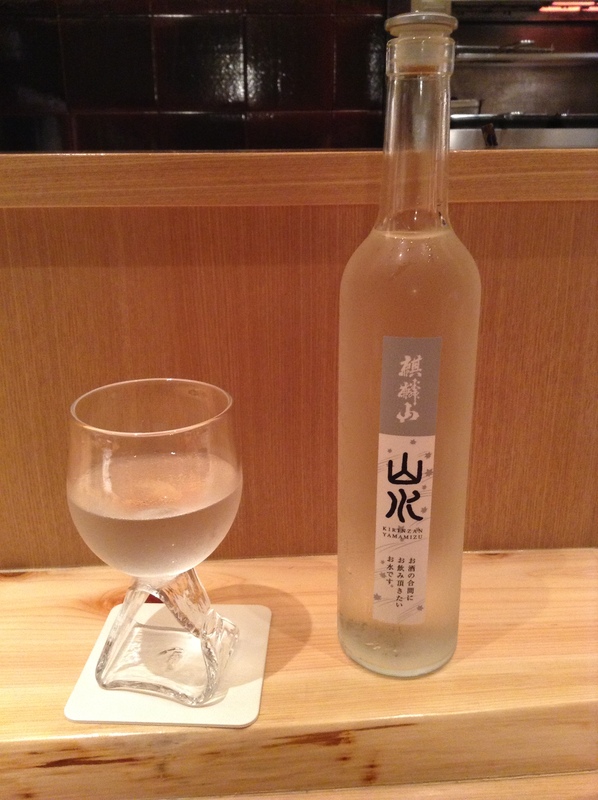 The chef’s wife is a kikizaké-shi, or saké sommelier. I asked her to pair each course with a different saké. 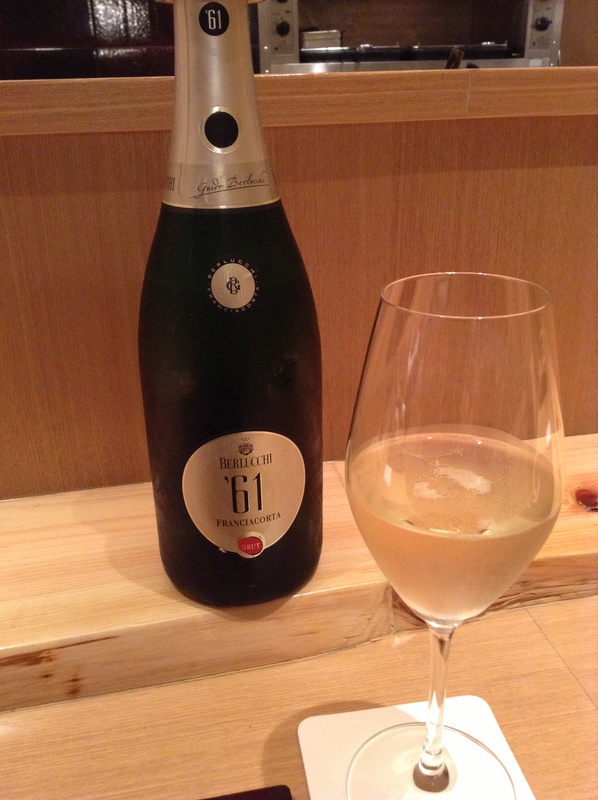 She started the night off with this dry Berlucci’s Cuvée ’61 Franciacorta sparkling wine. Made in the Méthode Champenoise style using traditional grapes of champagne, chardonnay and pinot noir. 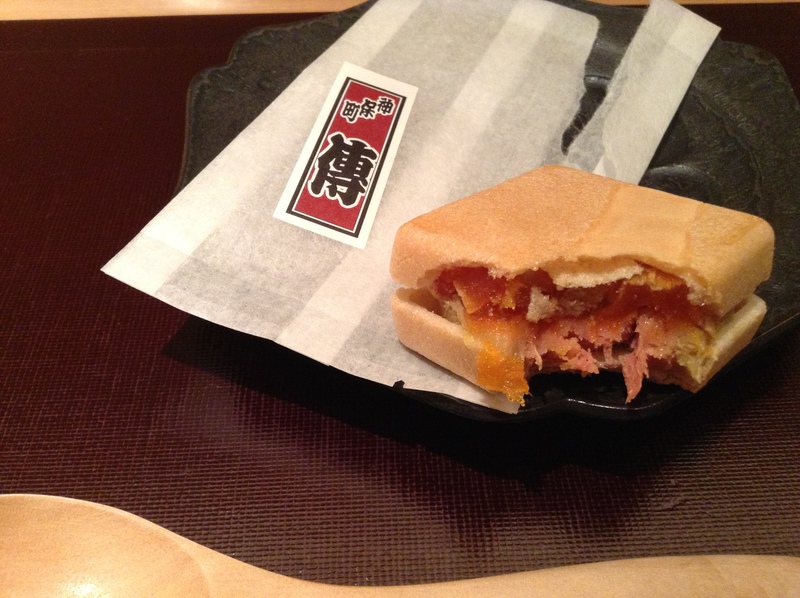 The first bite was sandwiched in monaka, rice wafers. These usually are used with sweet azuki beans and served as a dessert, and it is here where I could see the playfulness of the chef. Inside was foie gras that was marinated in white miso for ten days, adding umami and amami (sweetness as white miso is sweet). It also includes hoshigaki (dried persimmons) and one of my favorite pickles, iburigakko, a smoked and pickled daikon. The first course was brilliant and I could see that it was unique to chef Hasegawa. 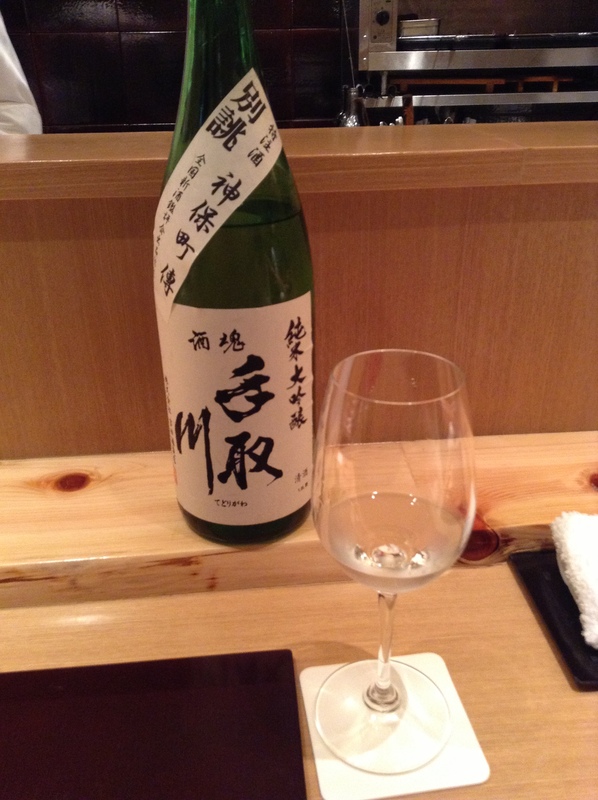 The first saké served this night was from Ishikawa prefecture, Tedorigawa Junmai Daiginjo. It is only available here at Den as it is a house blend made for Den. It’s a soft saké that will pair with a lot of different foods, and was perfect with this fun dish below. I had to laugh when chef handed this dish over the counter. There was a frog peeking out from junsai, a type of water lily that is famous for having a mucous membrane surrounding each leaf. 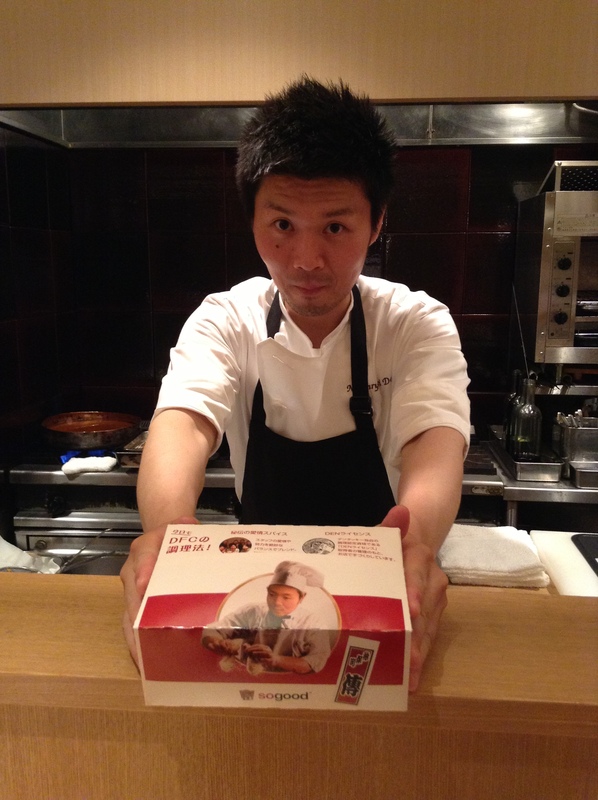 Chef Hasegawa said that they were foraged in a lake that morning in Hyogo prefecture. The frog and junsai was resting on a lotus root leaf, exactly where you may find a frog leisurely passing time on a hot summer day. 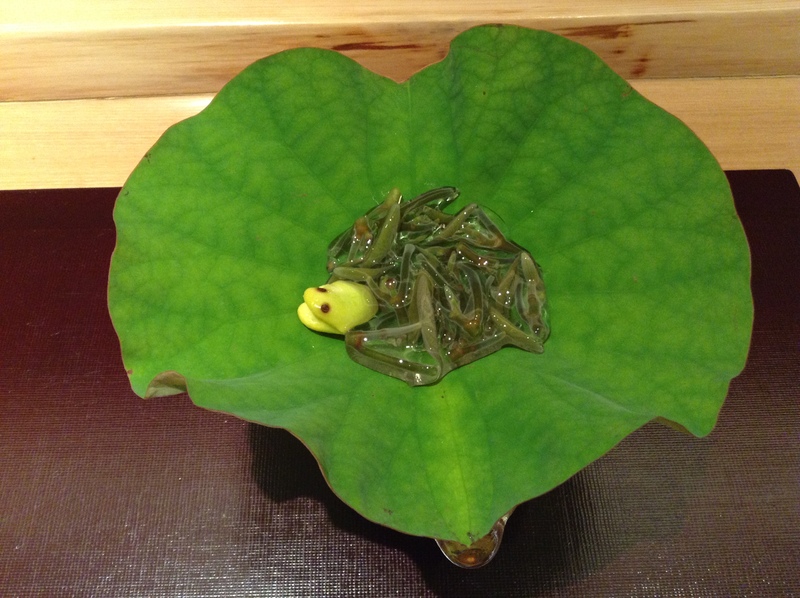 Chef Hasegawa said to fold up the edges of the leaf to put the junsai and frog into the glass bowl. Inside was tokoroten, strings of jelly that chef made with tomato juice and tengusa seaweed. 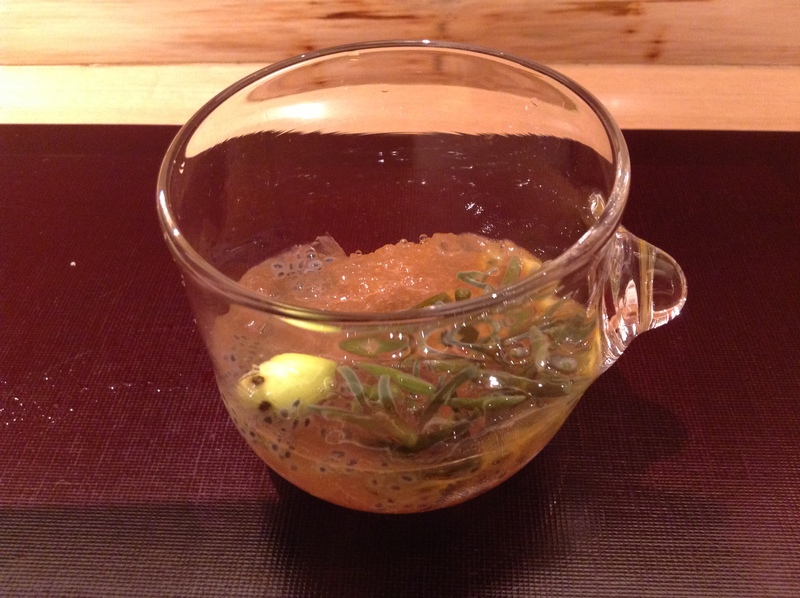 Inside was basil seeds, passion fruit, and tobiko (flying fish roe) adding even a richer texture to the tokoroten and junsai. The water serves water from a saké brewery in Niigata, Kirian Yamamizu. The fun water glass was made by an artist in Hokkaido. 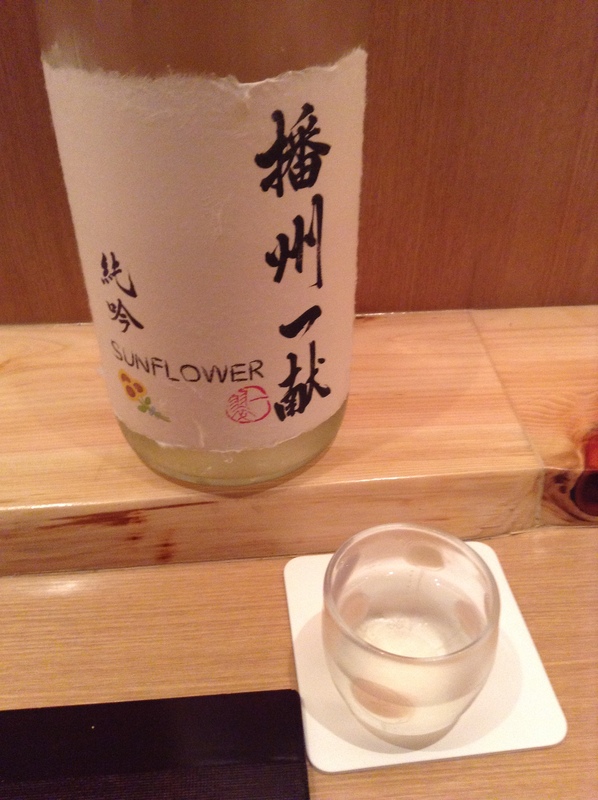 The next saké was Banshu Ikkon’s summer sake, Sunflower, from Hyogo prefecture. Light with a dry finish. It’s always a treat to have a saké in summer that was made for drinking in summer. I also loved this glass with dotted with pastel spots. Also made by the same artist who made the water glass. What? Did he get KFC take-out? I loved this too being passed over the counter. On closer inspection I could see it was not KFC, but DFC, and the colonel was actually chef Hasegawa. Again, great fun. Inside the box was a chicken wing stuffed with turmeric seasoned sticky rice with almonds and raisins. I could eat a whole bucket of these. 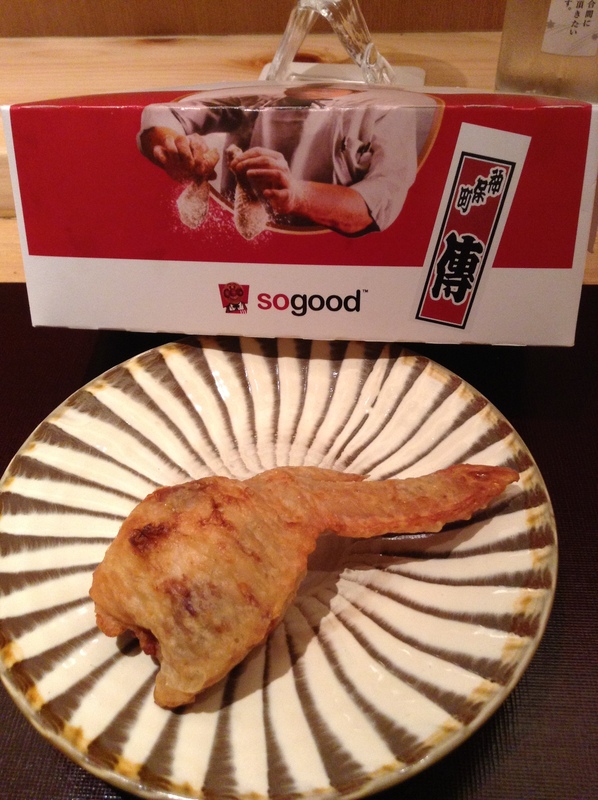 The gorgeous dish under the chicken is Ontaiyaki in Oita prefecture. You were one of the people who led me to Den. Arigato Aiste! Looks like an amazing meal! Totally envious. Sumi, you have to go when you are back in Tokyo. What a unique approach! And I’m so pleased for you that a sake sommelier was around – you must have been having some deep conversations about scents and hints. It was so much fun as many of the saké were brand new to me, especially the summer only sakés. I hope you can make it here on your next trip to Tokyo!